In 1963, the Ku Klux Klan bombed 16th Street Baptist Church in Birmingham, Ala., killing four girls. The teens could feel “this is where history took place,” leader Mike Thompson said. Sixteen-year-old Jasmine Bates took a seven-day ride through history last week, and along the way learned something about herself. 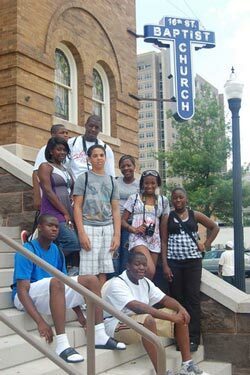 The Myers Park High junior was part of a civil-rights tour through the South with eight other African American teenagers from the Stratford Richardson YMCA in Charlotte. In Memphis, Tenn. they stood at the balcony of the Lorraine Motel, where Martin Luther King Jr. was gunned down in 1968. It's now home to the National Civil Rights Museum. In Clarksdale, Miss., they saw guitars of bluesmen Robert Johnson and B.B. King, and remnants of Muddy Waters' birthplace at the Delta Blues Museum. In Birmingham, Ala., they stroked the monuments at Kelly Ingram Park, where King and others organized boycotts, and where Bull Connor turned his police dogs against demonstrators in May 1963. And in Selma, Ala., with the afternoon heat approaching 100, they walked the Edmund Pettus Bridge, where in 1965 state troopers and local police clubbed and tear-gassed voting-rights marchers. “Our guide said he was 11 then, and spent time in jail. He said he and his friends would skip school to go march,” Jasmine said. “So we learned that children were a part of the movement, too. After taking this tour, I understand better the cause they fought for. Which is why Pfeiffer University history professor Mike Thompson assembled the trip, designed after a tour he took last year with civil-rights leader Julian Bond. Thompson created the itinerary, and Pfeiffer and the Stratford Richardson Y (named for the late Willie Stratford and Jim Richardson, two Charlotte African Americans who fought for equal rights) made it happen. The group left the Pfeiffer campus in a bus June 14, and returned to Charlotte Saturday. “I wanted to make certain that kids are still engaging in history and acquire an understanding of the movement that is more complex than just listening to King's ‘Dream speech,' and the Rosa Parks story,” Thompson said. “… We could have easily stayed in Charlotte and watched documentaries and read the words of King and John Lewis – and they would have learned a lot. After a few days on the tour, 12-year-old Beau DeVaul understands “the astounding courage” it took for his black father and white mother to marry. And when he's old enough to vote, he won't take his rights for granted. Thompson and Jessica Williams, who coordinates the teen activities at Stratford Richardson, want the tour to become an annual part of the Y's summer programs. Along the way, Thompson, Williams and the students blogged their trip. On the sixth day, after 1,600 miles, Thompson wrote he expected to witness a “gripe-fest” from tired teens. But at the Dexter Avenue Baptist Church in Montgomery, King's first church, the students thanked him for taking them on the trip. “It was heartfelt – honest to the core,” he wrote.